Synopsis: Jack Reacher is back. Review: I have read many books in the series written by Lee Child & Douglas Preston about their Pendergast character and I enjoyed each of them. Yet I’ve never had the opportunity to read a book by only one of them. 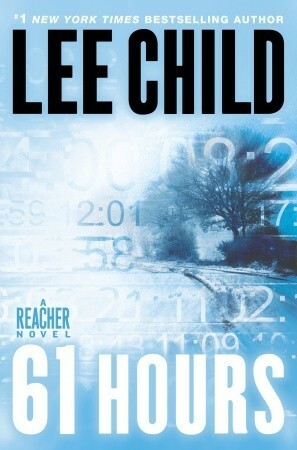 So when I found this series by Lee Child, I admit that I was intrigued. Good by cons it is true that I start here with Volume 14, but I can tell you that it is really not a problem! Besides, I’m quite intrigued and excited to have the opportunity to read the others now. Looking at the synopsis of the next one, I realized that the novels are not necessarily written in the order, so yes, you can start with this one! But now it’s terrible because I want to read more, but the following events! Let’s start with the title, 61 hours … Oh yes because it’s really important. The whole story takes place over 61 hours. We indeed discount gradually during the history and we’re eager to see what will happen after that date. It is in this environment that we find Jack Reacher, a man, a former soldier who tries to escape his past, as well as his future and is in a very complex situation. By having a few glimpses into the lives of other characters, we follow this ancient military in an explosive investigation. Oh yes, because while arrived accidentally in a small town, he will have to put his skills to help everyone. Between the control of a witness on tight surveillance, a prison that might help a murder, a biker gang selling drugs, an old abandoned bunker that could be much more important that it seems, Reacher will have many things to do. I had a great pleasure in following this story, much more than I would have thought I confess. The hero is exciting to discover and to understand. He is very intelligent but does not work to be awarded in any manner, which is quite nice. He will be embedded in this story and will do everything to help the local police while doing it his way. I appreciated seeing the stroke lead he had, how he had to find his answers, as well as his very special nature. Oh yes, because he does not live like anyone else and despite his sense of distance, he is touched by the events. We also have a large number of very intense points about him throughout the story … Yes my heart sank several times for him. Did I forget to mention the young woman he often has on the phone? As I have loved their discussions! For answers, he contacted his old division, something he has never done since he left the army and that’s how he discovers this young woman. It is through various short dialogues that they’ll get to know and help each other a little bit. But something else appears between them and we will need a little time to learn more about her, as well as Reacher’s, I found that the author was perfectly able to carry his story to reveal information about his characters at the perfect time. But I admit that now I can’t wait about the meeting between the two characters to see what happens then. I can not say much about the story because many revelations we will be given throughout the novel, linking all the events and allowing us to understand what exactly is happening and it is true that the whole thing was just exciting! In fact, I was very surprised by the culprit of the story, as well as several turns of situation and I think you will be too. I want more! lol I know it’s not what you usually read. Me too! I really enjoyed this one. Oh my mom LOVES his books. We really don’t read the same things at all (me and my mom) but sometimes it’s fun to step out of the norm and try one like this 🙂 Glad it was working for ya! it’s true that it’s different, but I really enjoy the genre from time to time. Oh I think this is so far out of my comfort zone I probably won’t be giving this a shot. Although, as a side note I can’t believe this is volume 14 in the series! God how can an author write so much? lol and it’s book 14 in France but it’s much more in English, like 19? I think. Usually, I’d be boggling at the fact you started at book 14 of a series, but for this one I wasn’t surprised you got to jump into it right away 😛 I think these particular books were meant to be easy to jump on board no matter where you are in the series, with one focused case per book. Anyway, I’ve actually read the first Jack Reacher novel! It wasn’t my genre, but I enjoyed it okay. yeah I know… At the end you know me. Ah I’m sorry it wasn »t for you. Glad you were able to jump tight into this and not have an issues and that you liked it so much. I haven’t read anything by this author and I have been curious as these books are always on the NY Times List. I like that you can start on book 14 and not be lost and that it is fast paced and full of twists. no it’s ok, I think it’s really not a problem with the series. Sounds like this is fast-paced, which I love. 61 hours, I can tell it’s packed with the good stuff! I agree me too! And these ones were really fun as they both play a different role. Yeah, usually this kind of books are very episodic. It’s like that with James Patterson’ s ALEX CROSS series… I think there are almost twenty books in there but you can pick one from any of them and still understand what’s going on because each book has a story of its own. 🙂 With that said, you got me excited here. I miss this kind of book and I think it’s time I go back to try to get out of my book slump. Thanks for the awesome review! yes, it’s interesting to have a series like that but now I want the meeting with the woman on the phone and it’s not the sequel. It’s sad. Being surprised by a plot and the culprit of a book is so rare for me now a days. Sounds great. Not a fan of this author, I think it safe to say I’ll be giving this one a miss. Thanks for sharing your thoughts, I’m glad you were left wanting more. wow, the plot that is all in 61 hours! Hah, 62 hours. It’s like the TV show 24, Lee Child style. My sisters adore this seires but I’ve never read it. Perhaps I should. Great review. I’m glad you enjoyed this one. I’ve read a book in the series and enjoyed it as well. I’m going to have to check this one out! Hm… not sure if blogger ate my comment, so if this is a repeat, forgive plz. I’ve read a Reacher novel and could skip the others as well. I’m going to have to check this one out! My dad loves Lee Child but I have never read any of his books, I should really check them out.